25% Bonus on 1st deposit, immediately available! RoboForex offers 25% instant forex bonus to everyone with an account, new or registered. This bonus is immediately usable for trading. Forex bonus is added immediately. Bonus will be added to your account immediately. RoboForex is a young forex broker that started its operations in 2010. They chose MetaTrader as their trading platform of choice, which is a very good decision, since MetaTrader is the biggest independent trading platform in the world. 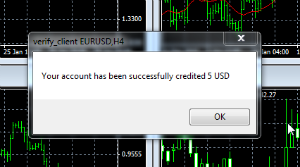 (it's free and it supports many forex brokers). 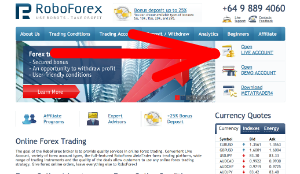 RoboForex is based in Auckland, New-Zealand (ROBOFOREX LP, reg.#2538375) but is still unregulated. Besides currencies it also offers its clients to possibility to trade in futures, stocks, metals like gold etc. The minimum deposit is only $10, and the minimum position is 0,01 of a Standard Lot, meaning 1000 units. Leverage is max 500:1. 4 Make a 1st Deposit and Bonus will be credited.